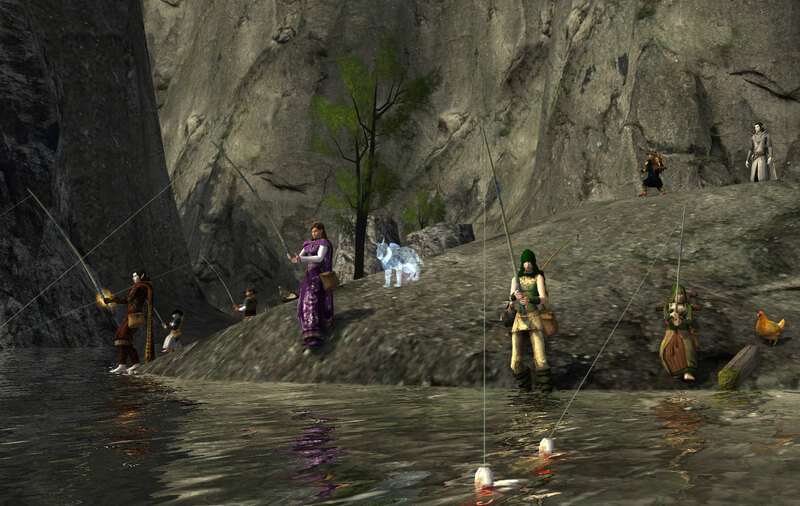 Friday Fishing Club has recently been started up again by a wonderful kin-mate; Tomeoric – Hooray! 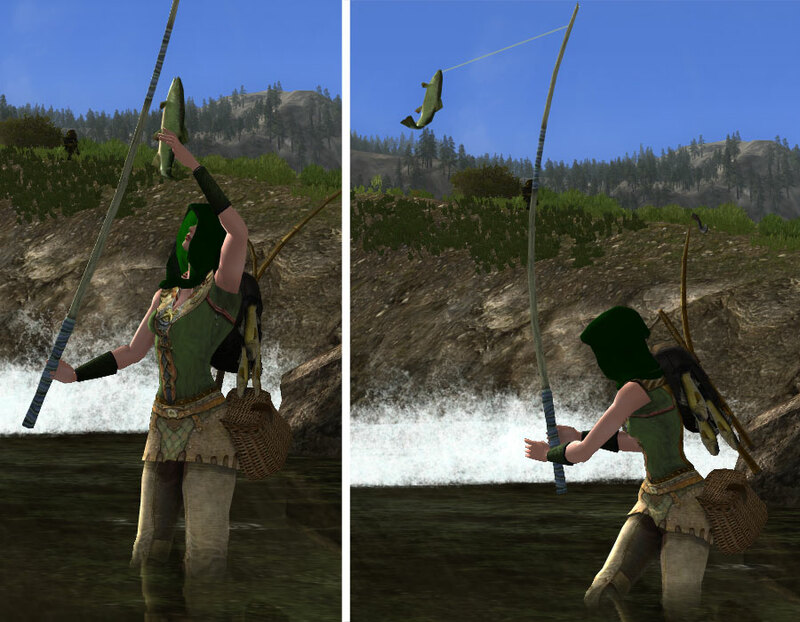 With visions of crispy batter-fried fish and forays into the wilderness to find the perfect fishing hole, Lhinnthel put together this simple outfit for Friday evening fishing. I know, I know – this is the same vest and bracers featured in the last fashion post. What can I say, it’s a cute top and goes well with a variety of pants styles. The bracers are my favorite hand cosmetic, yet I shall promise to have Lhinn don something different next time! The Fisher’s Backpack is the perfect place to store an extra pole, your fillet knife and a handy net for extra slippery fishes. It even comes with three freshly caught fish – for when you get too carried away dancing to music or chatting with friends instead of watching your bobber. You’ll never go home empty-handed, with this well-equipped pack! 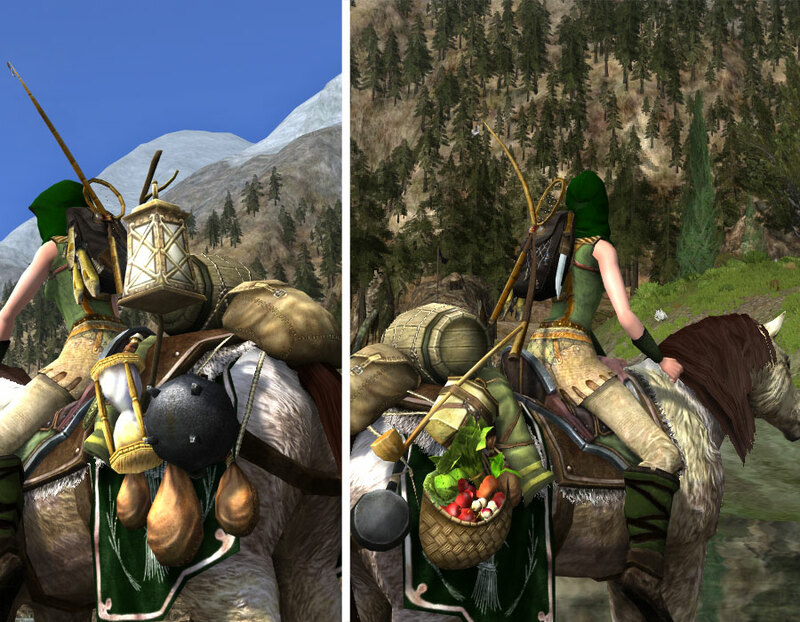 I’d like to say that this outfit is based on that very practical Fisher’s Backpack – but in truth the lovely green and tan color of the leggings were the starting point. The wrinkling of the leggings, just above the boot tops, is perfect for wading. I do love the subtle diamond pattern on the skirt portion and the little rusty-colored fasteners perfectly match the straps on the vest. The leggings are also very comfortable – so important when you are trudging through rapids or testing your strength against that coveted 50-pounder! Though Lhinn usually likes to go around hood-less, the sun can get quite wicked during midday outings. 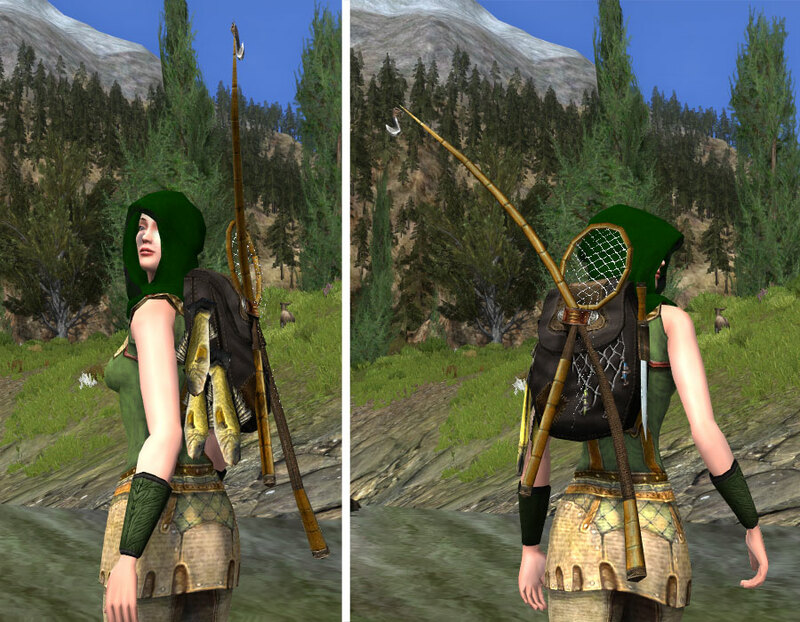 This lovely new hood has the same appearance as the Traveler’s Hood (found in the store), but without the center trim. If you look closely, you can also see a pretty pattern reminiscent of tall waving grasses. 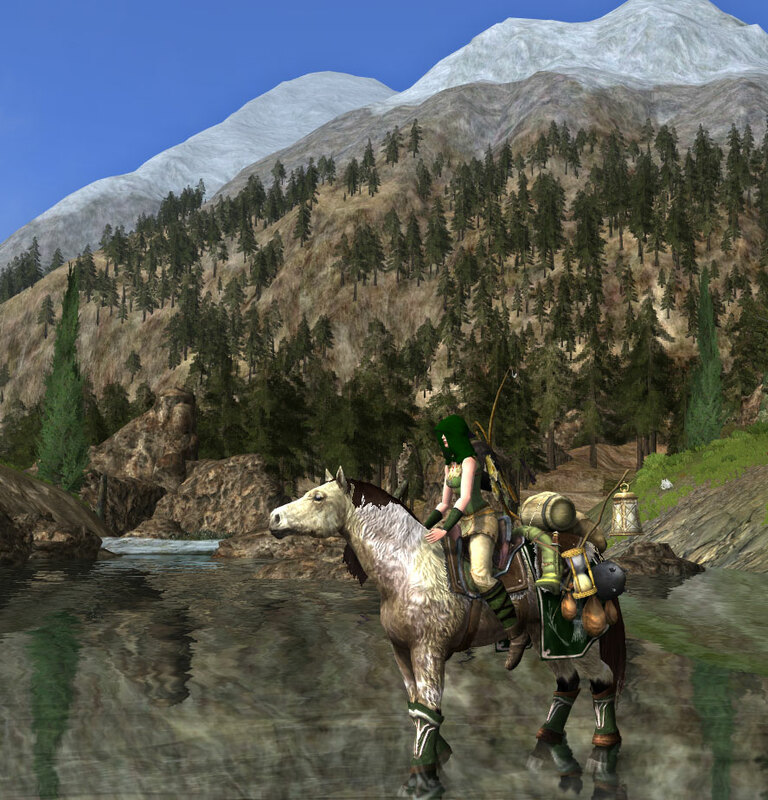 With such a fine fishing outfit, a matching steed is a must have! My light war-steed, Calista, is prepared for anything, with the accessory of Michel Delving on her backside. We’ve fresh vegetables for munching, a pan to fry up those fish, a pipe and blanket to catch a few relaxing moments, a keg of sweet ale, bags of various herbs and sundries and a lantern to guide us home. We might travel far afield to find the weekly fishing spots – this fur-lined light caparison of the Sutcrofts will ensure both Calista and I have an enjoyable ride. All that’s needed now is a group of merry friends to call back and forth to as the fish bite! 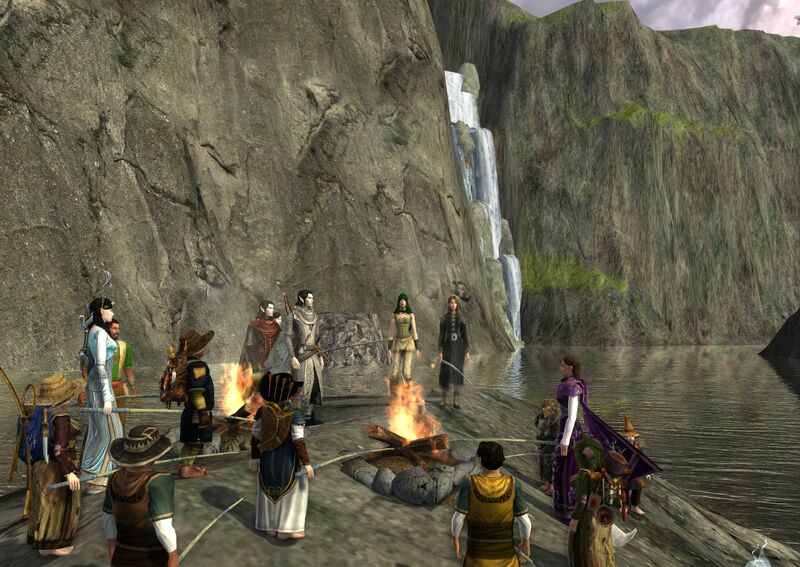 Miss Rozalinde, Faerochil, Corulin and Tomeoric are a few of Lhinnthel’s dear friends, in this photo. Isn’t this a beautiful location? Our trip guide brought us down a little path leading from the south end of The Trestlespan. There is a nice view of the tall waterfall and a short swim will bring you to a tiny island that’s perfect for casting. Next time, someone must remember to bring the marshmallows! Ha! Found Lhinn’s blog! Very nice article and screenshots – I like the last one of the FFC last Friday! Now it seems the fashion-level of FFC has cranked up a notch. It seems I’ll not be able to phone it in on my fishing club outfit, otherwise I’ll meet Lhinn’s disapproving eye… to the wardrobe! What? 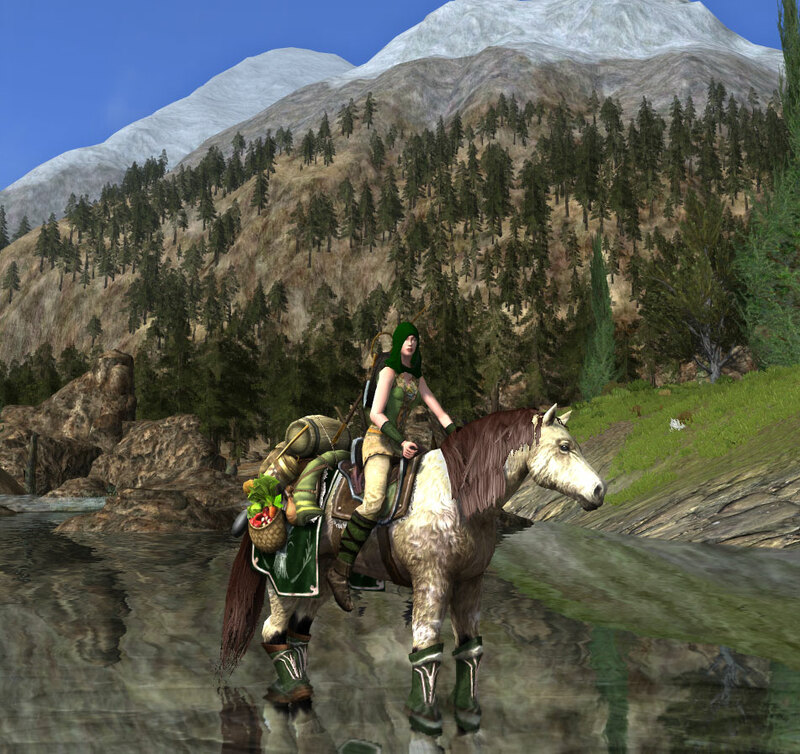 Lhinnthel has a blog? Hey look, that’s me! Wonderful write-up, and brilliant fashion sense! It seems I’m going to have to bring my A game to future fishing meet-ups.